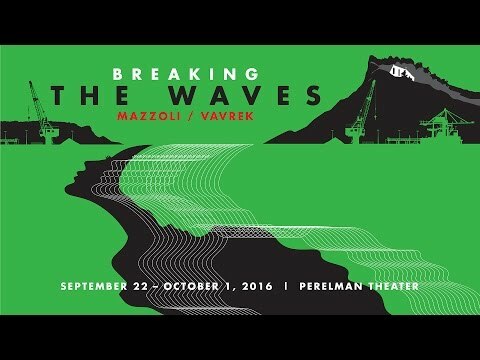 On September 22, 2016, Opera Philadelphia will give the world premiere performance of Breaking the Waves, a new chamber opera by composer Missy Mazzoli (MM) and librettist Royce Vavrek (RV) based on the 1996 Academy Award-nominated film by Lars von Trier. The duo previously collaborated on the 2012 chamber opera Song from the Uproar. We asked them five questions about working together, adapting a film for the stage, and capturing geographical and visual aesthetics. Following the success of your first collaboration, Song from the Uproar (2012), did the creative process change or evolve when writing Breaking the Waves? MM: Breaking the Waves is a very different kind of piece from Song from the Uproar in that it has a more concrete narrative and a clearly defined dramatic arc, so our collaboration was focused much more on clear storytelling and ways to distinctly outline each character and theme. I think at this point we’ve also come to know each other incredibly well, which leads to a very rich and exciting creative partnership. We can play to each other’s strengths, but also feel free to tell each other when a line of the libretto or a musical passage is just not working. We’ve grown tremendously as artists in the last four years, both through our work on Uproar and other projects, and we go to see new work together nearly every other day. As a result we’ve exponentially expanded our creative vocabulary and our shared frame of reference, and are both more willing to take risks in all aspects of our work. The work of director Lars von Trier is so aesthetically specific and rooted in the capabilities of the film genre, so why adapt this particular story? RV: I have loved von Trier’s film since I first saw it at the age of fourteen. I can remember seeing it on a very small television at a friend’s house, not the ideal situation to take in the very cinematic qualities of the movie. It was the story and the performances that really captured my imagination. As a storyteller now, I find that I am often swept up by the magic of the way other people communicate their narratives. When I become infatuated with a story, my life begins a lifelong dialogue with them that sometimes results in my wanting to translate them to my particular art form. Breaking the Waves had possibilities for new means of expression that I felt we could conjure, and through this adaptation we have created something our own, that uses the brilliance of von Trier’s creation as a catalyst. In addition to why you were drawn to this story, how does the operatic genre transform the original source material, either intentionally or inadvertently? MM: One of the most powerful characteristics of opera is its ability to communicate many different layers of emotion simultaneously. I felt that I could explore the characters’ psychology in a very deep and complex way because I was using music as my primary tool of expression. In this way our opera is very different from the original film, which had very little underscoring. In the opera, music intensifies the storyline but just as often subverts or contradicts the expected emotional narrative, all with the intention of illuminating the inner life of each character. I also bring back themes and motifs throughout the work, to tie characters and events together in unexpected ways. Royce, James [Darrah] and I also had to create innovative ways to communicate the intimacy of the many close up shots in the film, since opera always happens at a slight physical remove from the audience and it’s impossible to be right in a character’s face. We chose to see the aria itself as the operatic close-up, and often use solo instrumental moments, a cappella passages or repeated motives to create a sense of closeness or tenderness that can be communicated from the stage to the last row of the house. In light of your Opera Philadelphia sponsored trip to Scotland to conduct research for this project, how do you attempt to capture a sense of place in the score and libretto? MM: While the film was shot in various locations in Scotland and also in Denmark, we chose to root our opera firmly on the Isle of Skye in northern Scotland. When visiting the Isle of Skye I was immediately struck by how loud and violent the landscape felt; there were huge rock formations jutting out of lush green meadows, and seemingly infinite green expanses that ended in extraordinary plunges off cliffs into the ocean. I wanted to capture the drama of this landscape in the music itself, in the same way that a work like Peter Grimes captures the sound of the sea, even in the purely instrumental passages. When traveling in Skye I could very clearly hear how the opera would begin, with a massive, low chord that contained the sound of the waves, the rocks, church bells, and all the sensual violence of that unique landscape. RV: Going to Skye really unlocked a lot of the film’s clues, and allowed for the opera to reside in the environment. Although a lot has changed on the Isle in the last four decades, the residents that we spoke to suggested that the sense of place – its spirit – remained. It was important to us to retrace the footsteps of our characters: to walk out to Neist Point, to crawl into one of the little red public phone booths that pop up around the landscape, to commune with the sheep that outnumber the people. It made the world we were creating much, much richer. As artists who are involved in the contemporary opera scene, what consideration do you give to the interplay of modern audiences and topical themes? RV: I am hungry for so many different experiences when I go to the opera, and to the theater in general. It’s important that we continue to create work that explores the many facets of existence. The past tells us everything about who we are as a society today, and it’s important to remind ourselves where we’ve come from. It’s impossible to truly know what themes will be in the zeitgeist when we set out to write an opera, in this case over three years ago… but we knew that we had a powerful story with the opportunity to get under the skin of a modern audience, and hopefully future audiences. The emotional themes – loyalty, faith, goodness – of the piece is unmoored from any specific place and time and is truly an expression of the human experience.